I’ve found that when creating a lined-lapped zipper, trusting the process is always a better bet than going rogue. Order of construction is very important and as long as you take your time and make sure all your ducks are in row, it’s actually a breeze to sew up! The “Lap” in a lapped zipper refers to the fold of fabric on the left side that covers the zipper. 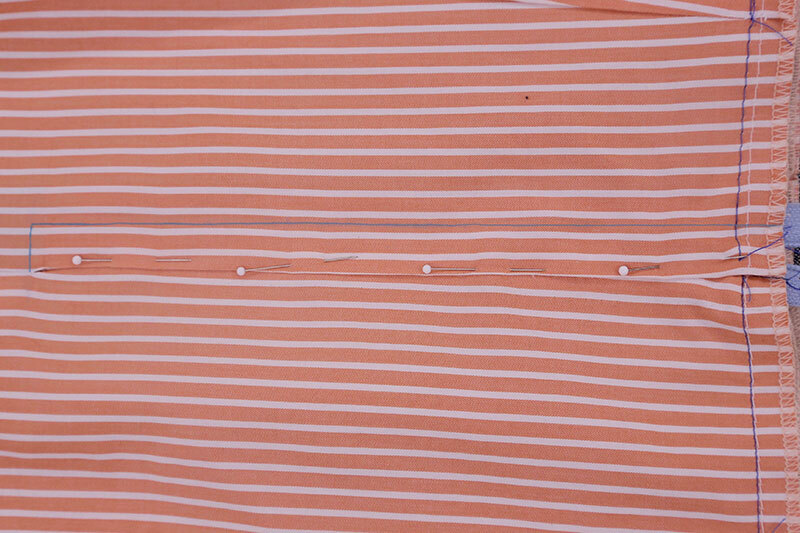 This fold of fabric is sometimes referred to as a placket. When adding a lining into the mix, the right back lining is wider than the left back lining. Having a narrower left back lining keeps the fold of the lap in place. 1) With right sides together, baste the center back seam at a 1” seam allowance to the small circle. At the circle, switch to a normal stitch length, backstitch a few times and continue sewing the remainder of the seam. 2) Clip through the seam allowance to the small circle, very close but not through the seam line. 3) Press the center back seam open to the clip-point, and press the remainder of the seam to the right. 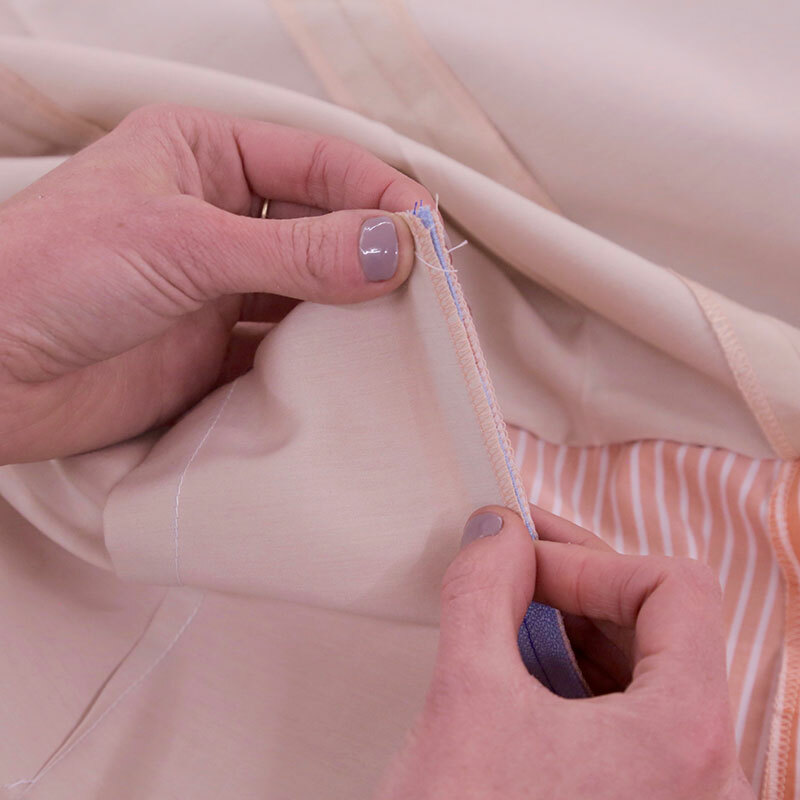 Use a seam ripper to remove the basting stitches from the waist to the clip-point. NOTE: If your skirt is made from a slippery or hard-to-press fabric, you may keep your basting stitches in place and remove them later on. 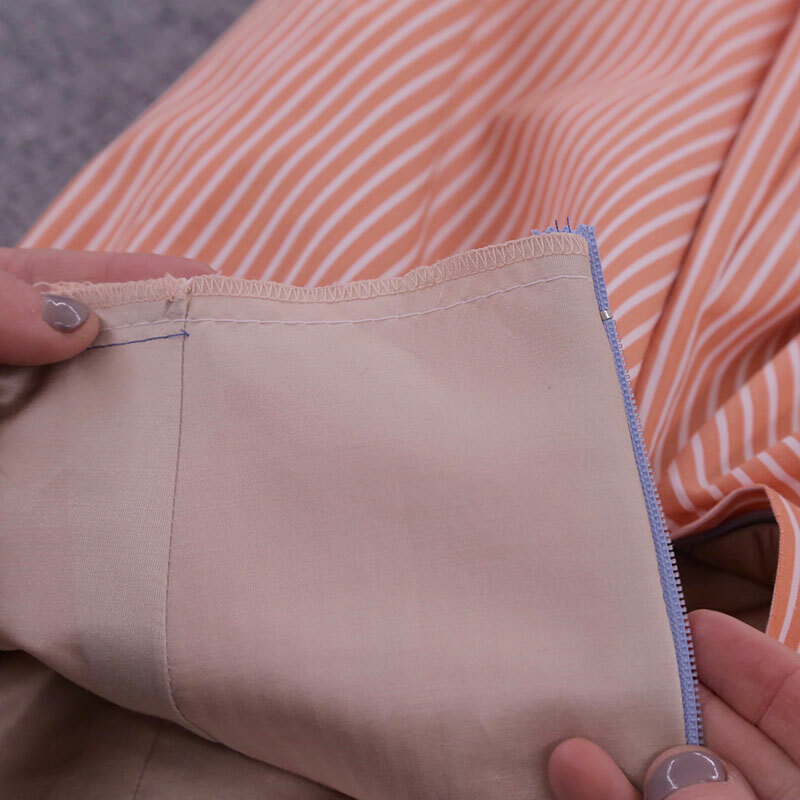 4) Unfold the seam allowance of the right skirt back and repress the fold to ½”. This will create a new seam allowance for the right side of the zipper. The left skirt back seam allowance will stay at 1”. 1) Open your zipper and the ½” seam allowance you just created. With right sides together, line the outside edge of your right zipper teeth up with the pressed edge of the right skirt back and pin. 2) Attach a zipper foot to your machine and baste the zipper to the right skirt back. After sewing, fold the seam allowance back in place and press. 3) To attach the left side of the zipper, line up the far left edge of the zipper tape to the edge of the 1” seam allowance on your left skirt back. With right sides together, pin in the zipper in place. 4) With your zipper foot still on your machine, baste the left side of the zipper to the left skirt back. Once sewn, the zipper will lay towards the inside of the center back under the fold. 5) After both sides of the zipper are basted in place, match up the back unit and front unit side seams, with notches aligned. 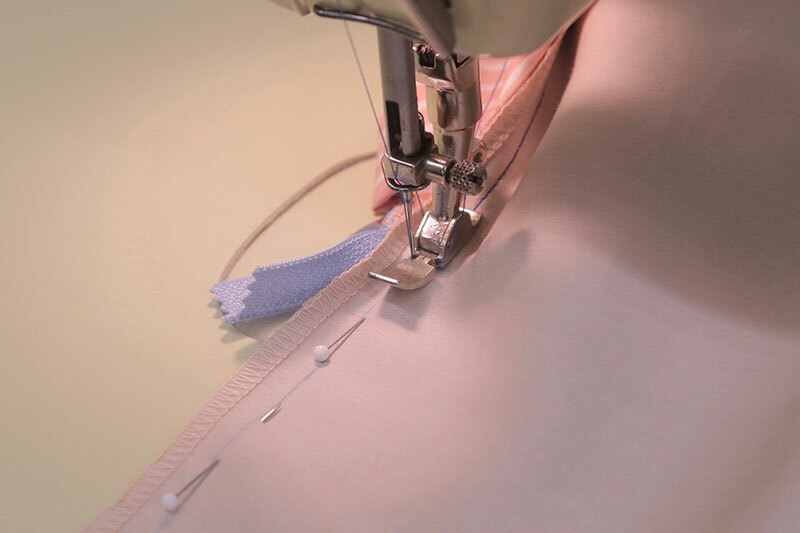 Pin and sew both side seams at a ⅝” seam allowance, at a standard stitch length. Press each seam open, and finish the seam allowances separately. Attaching the lining to a skirt is a bit counterintuitive. We are so used to sewing everything right sides together. To be honest, on the first go around, I assumed that this step was done with right sides together. But, thankfully for you, I made that mistake for both of us. 1) Pin the lining to the skirt at the waistline, from dart to dart, wrong sides together. 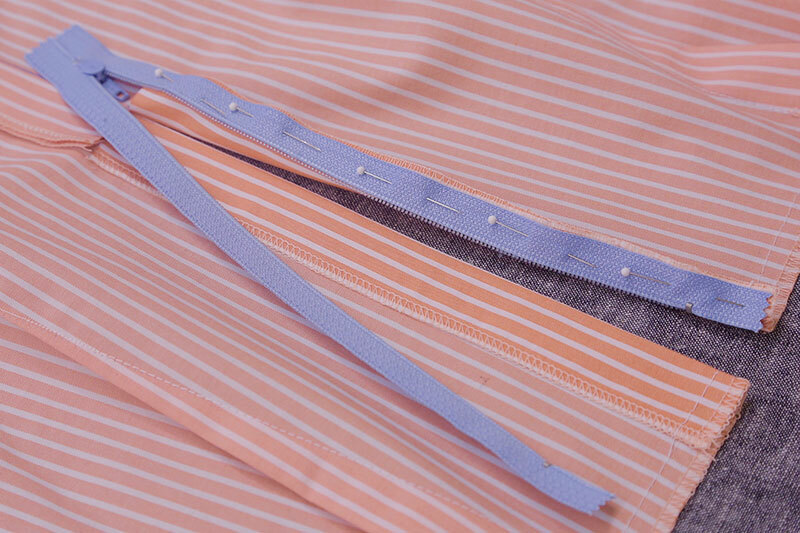 TIP: When pinning a waistline, I prefer to match up and pin the notches, darts, and seams first. Then, I pin the remainder of the waist line. This technique makes sure that any minor stretching on the waistline is evenly distributed throughout the waist. 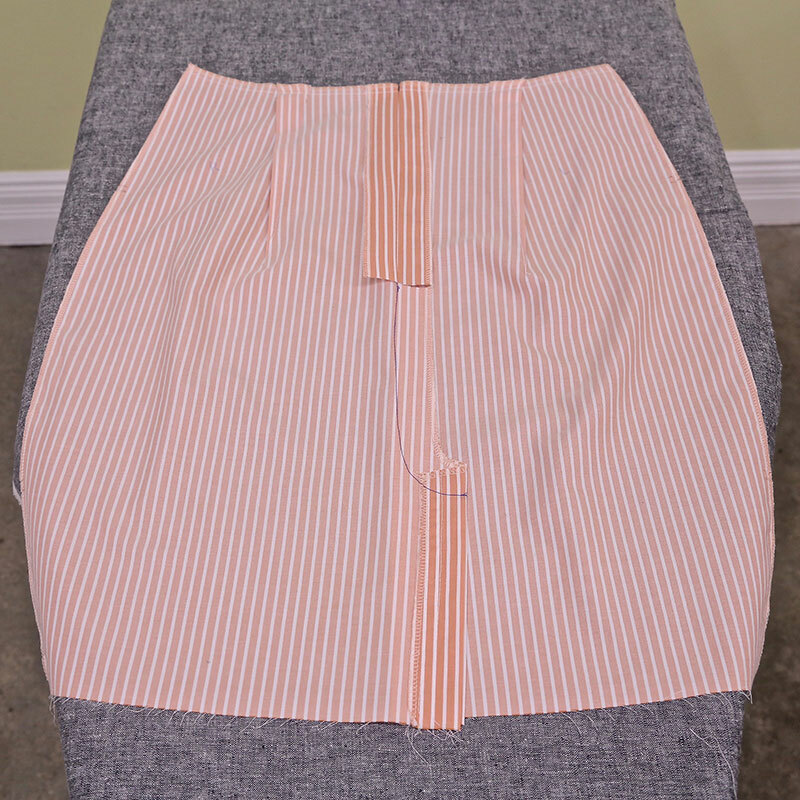 You’ll notice that after being pinned, the left skirt back and left back lining do not match up at the zipper tape, the lining is a bit smaller. Do not fret, you have indeed cut your pattern correctly. You’ll see in the next steps how this is the key to lining a lapped zipper. 2) After pinning, baste the lining to the outer shell, beginning and ending at the darts. 3) With the skirt right side out, bring the lining to the outside of the skirt, right sides together. 4) Sandwich the left back lining, zipper, and left skirt back together at the center back seam and pin. There will be a bit of extra fabric in the left skirt back, you might need to pin it out of the way in order to line up the center back seam. 5) At a regular stitch length, sew the left back lining to the left skirt back, along the previously made basting stitches. 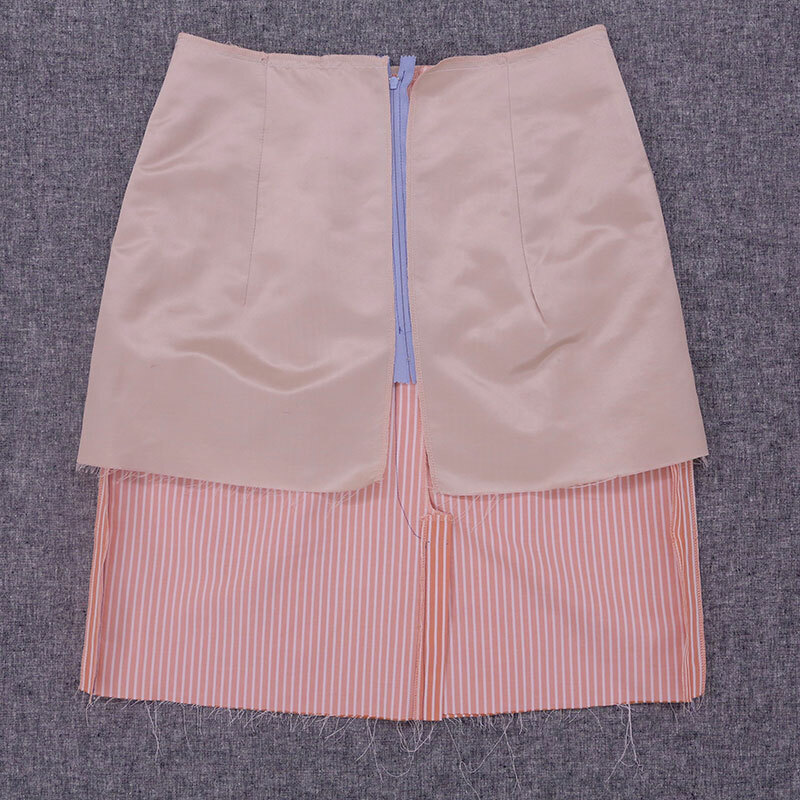 Turn the skirt right side out, with the lining on the inside of the skirt. You will see that the narrower left lining keeps the left lap in place. 6) Continue basting the left back lining to the left skirt back at the waistline, from the dart to the fold of the lap. 7) To sew the lining to the right zipper, turn the right back lining to the outside of the skirt. With right sides together, align the center back edges of the right back lining and right back skirt, with the zipper sandwiched between them and pin. 8) At a regular stitch length, sew the right back lining to the right skirt back, along the previously made basting stitches. 9) After sewing, bring the skirt right side out. You’ll see that the distance between the dart and zipper is perfectly matched! Continue basting the right back lining to the right skirt back at the waistline, from the dart to the fold of the lap. 10) Now, it’s time to sew the remaining center back seam of the lining. First, zipper up your zipper and turn the skirt inside out. 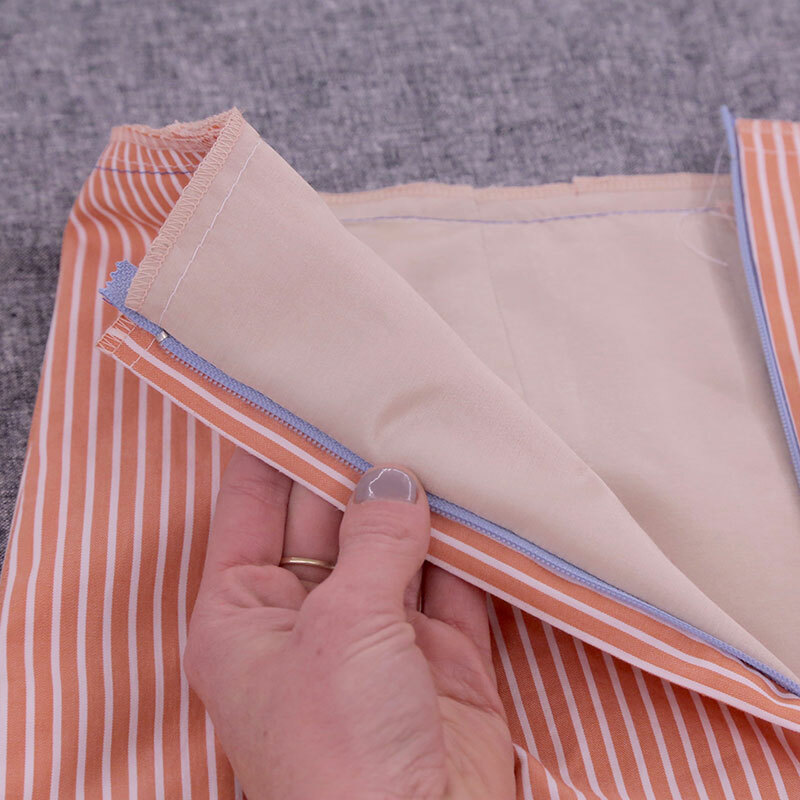 Move the lining away from the shell and with right sides together, match up the right back lining and left back lining center back seam and pin. I prefer to mark my seam allowance when finishing this seam. It helps me to keep a correct seam allowance at the more awkward sections. 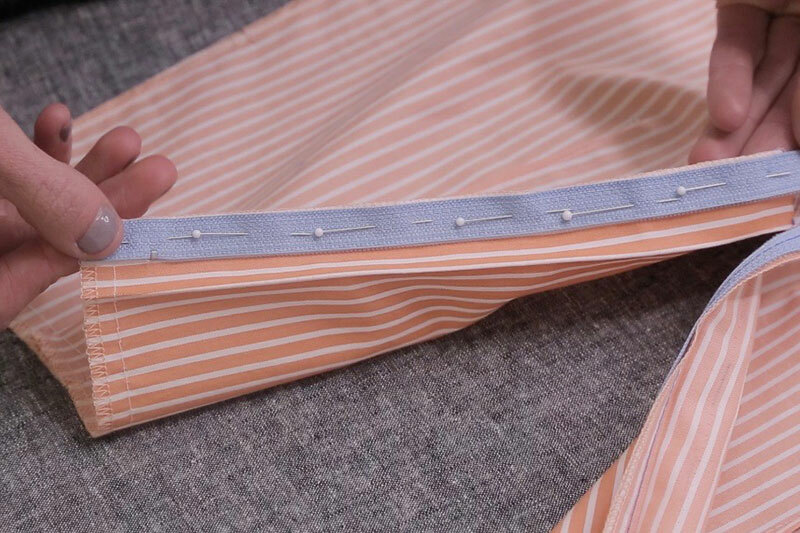 If you choose to mark before sewing, use a ruler and chalk to create a line ⅜” away from the raw edge, from the hem to where your zipper stitches end. 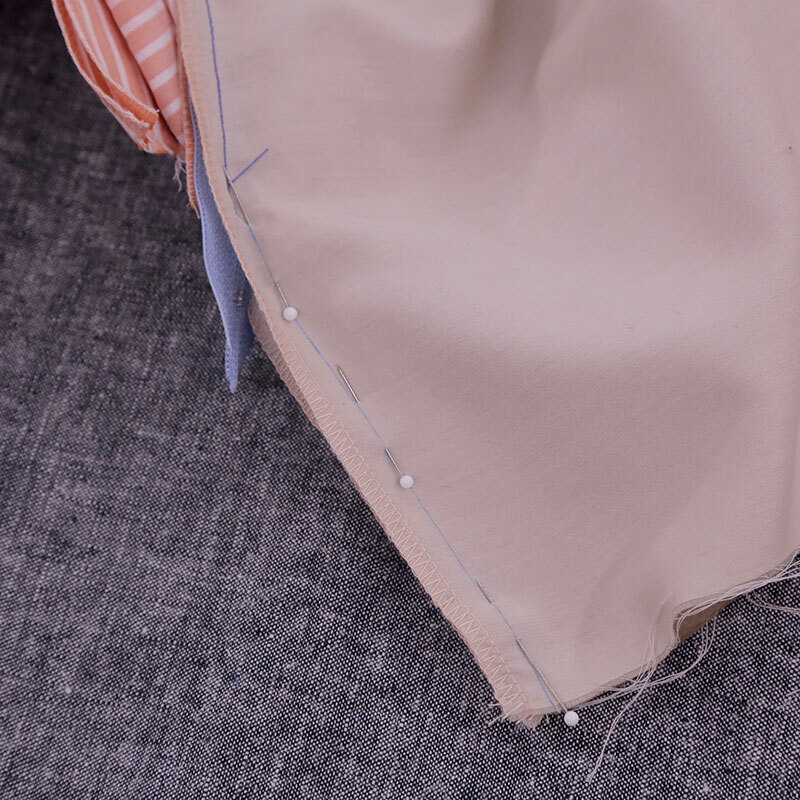 When sewing this seam, you may decide to use a zipper foot. At the top, near the zipper, there will be a bit of bulk and a zipper foot will help you get nice and close to the zipper and keep a correct seam allowance. 11) Making sure that the zipper tail is pulled back, sew a ⅜” seam from where the linings are sewn to the zipper all the way to the hem. 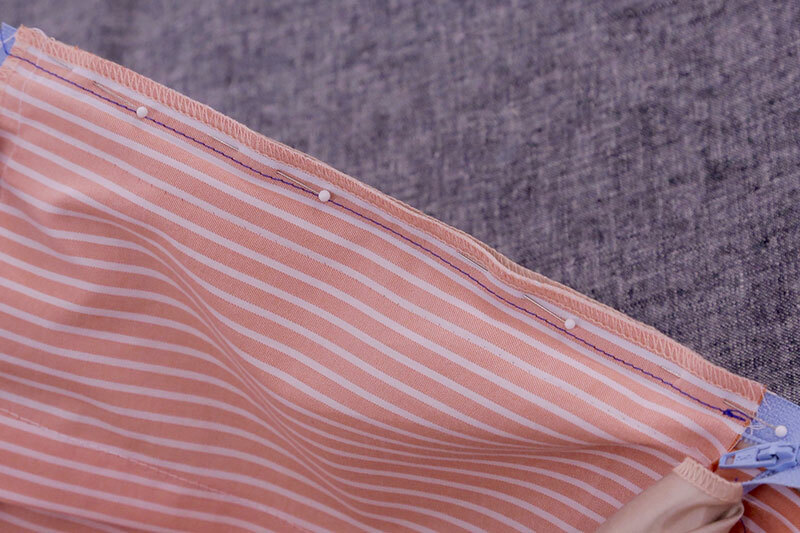 You’ll notice that this technique is almost exactly the same technique you would use to finish sewing a center back seam with an invisible zipper. If it is not perfect, the next step will add some strength to this area that will keep everything secure. We are almost there! Now it is time to sew the quintessential “L” of the lapped zipper. 1) Start by turning your skirt right side out and give it a nice press. Pin the lap of the zipper down, this will keep it from moving while marking and topstitching. 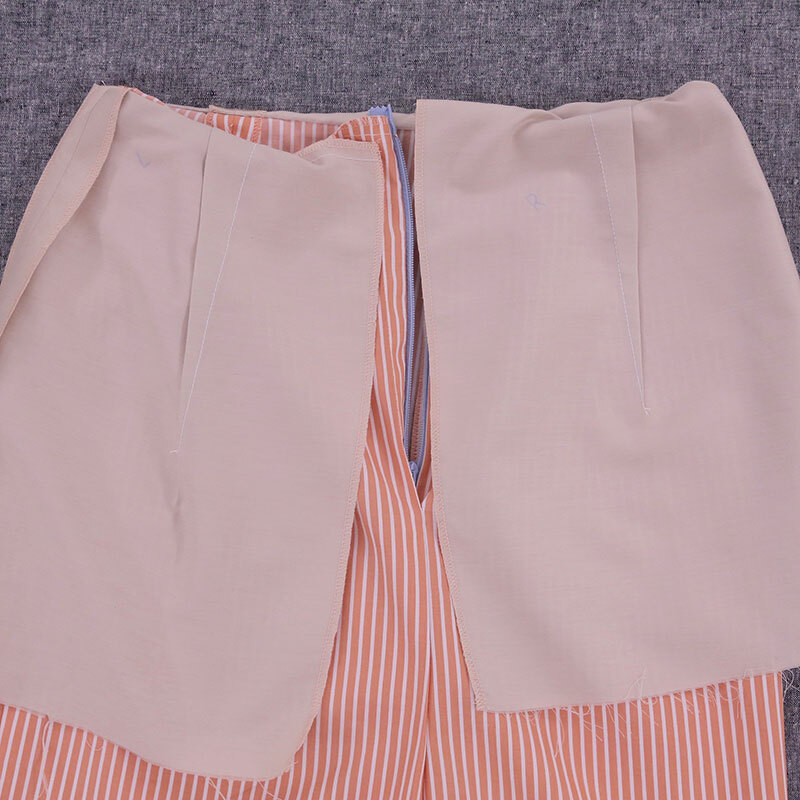 The topstitching should land as close to the seam line that was created when sewing the left back lining, left skirt back, and zipper as possible. Measure the distance between the folded edge of your lap and that seamline. It should be around ½” to ⅝”. 2) Next, on the right side of your skirt, mark your topstitching line. 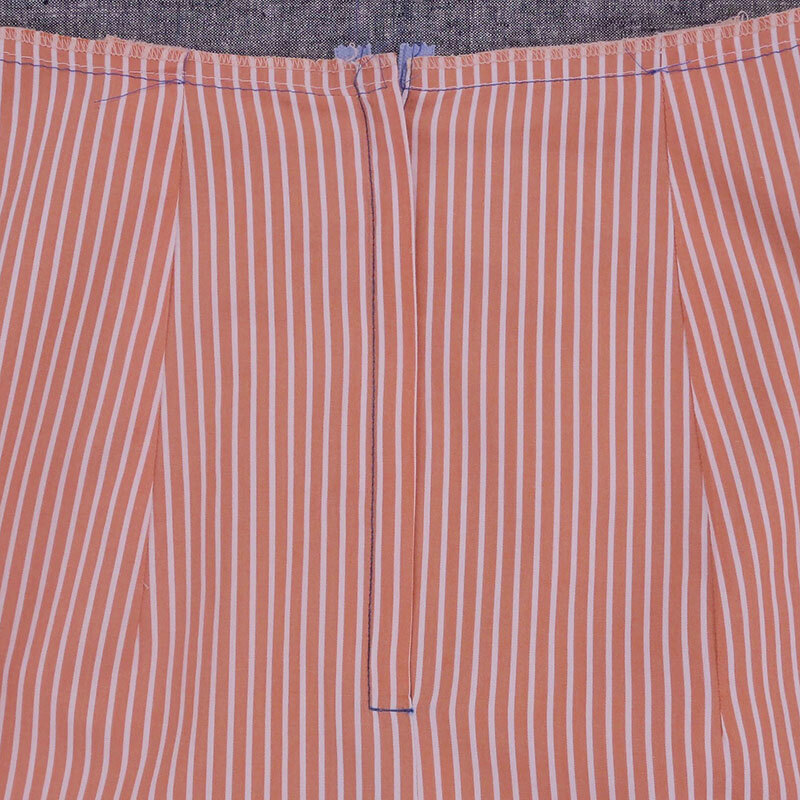 Start at the waistline down to where the lining center back seam begins. 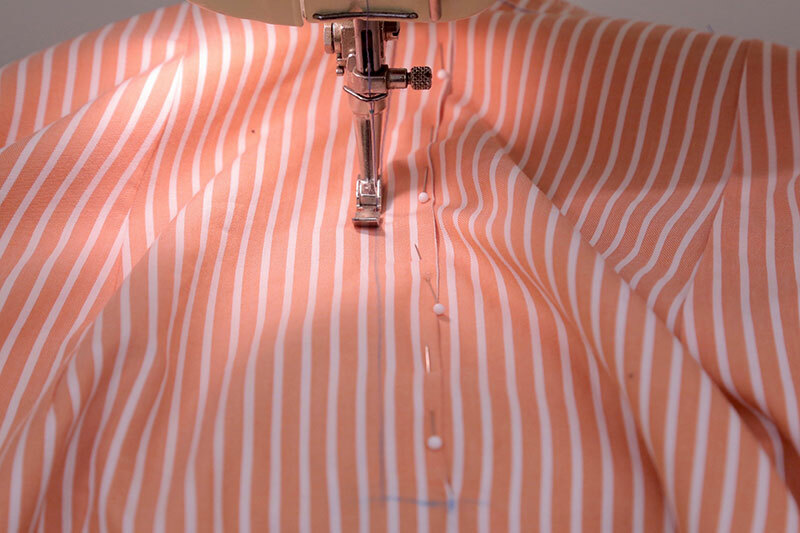 At the end, mark a horizontal line to the center back seam, creating a “L” shape. 3) To topstitch, begin at the waistline, stitch along your marked lines, pivot, and back stitch several times at each end to secure. You’ll notice that I kept my zipper foot on; by no means do you need to use a zipper foot for this step. For me, it’s just nice to be safer than sorry when there is extra bulk on one side of a seam. … and Voilà! You have sewn up a lined-lapped zipper! We’d love to hear how your lined zipper turned out. What was the most challenging aspect of the technique? 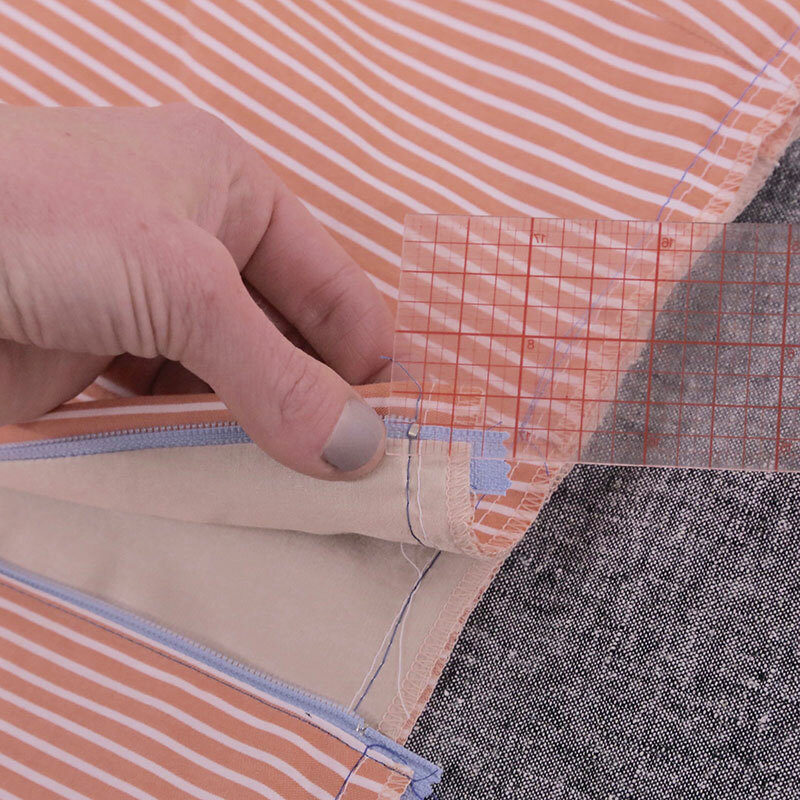 Do you have any tricks that you use when sewing a lapped zipper? Share your stories below! Great tutorial! I am looking forward to referring back to this when I sew up my Selene. Thank you so much for this tutorial! I really appreciate the pictures that you have used to illustrate the steps and have already bookmarked the page for my next project! I often use video tutorials to help me along, but much prefer illustrations and images to help me ‘see’ what I need to be doing with my own project. Wonderful, as always. Your step-by-steps are so helpful. Is there any way you can add “Pin It” to your tutorials? I’d like to save them in my Pinterest sewing folder. Thanks for considering my suggestions. Thank you for the tutorial. However some of the photos are blurred and difficult to see. Awesome tutorial ! Thank you for sharing ! Great tutorial, thanks! Question-The skirt was cut with a 1-inch seam allowance for the zipper seam. 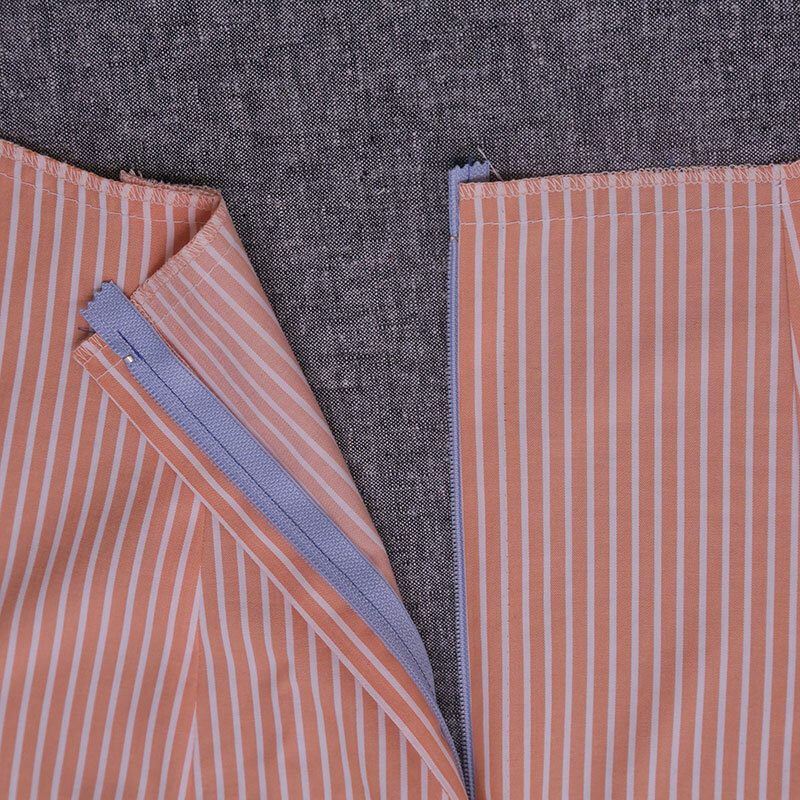 Is the lining cut with a 1-inch seam allowance also, or the traditional 5/8-inch seam allowance? Hello Carla, I’m glad you enjoyed the tutorial! 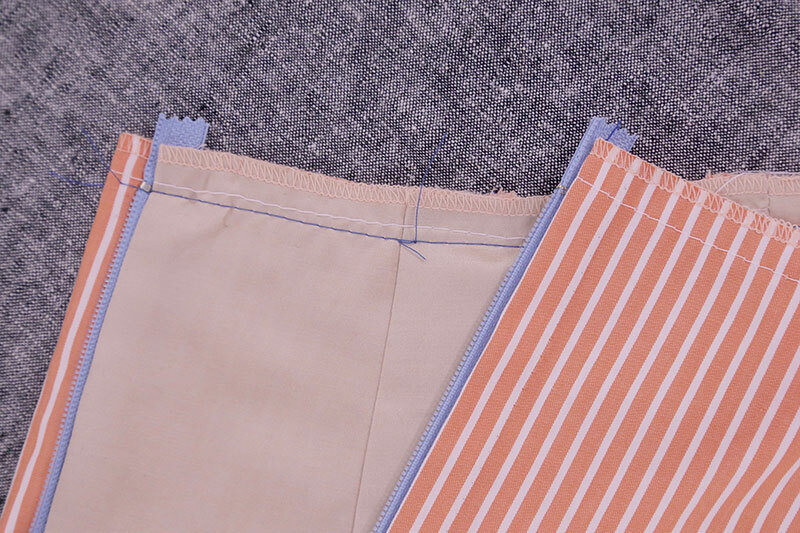 The lining center back seam is cut to a ⅜” seam allowance, just enough to sew the zipper to the lining and finish to the hem. 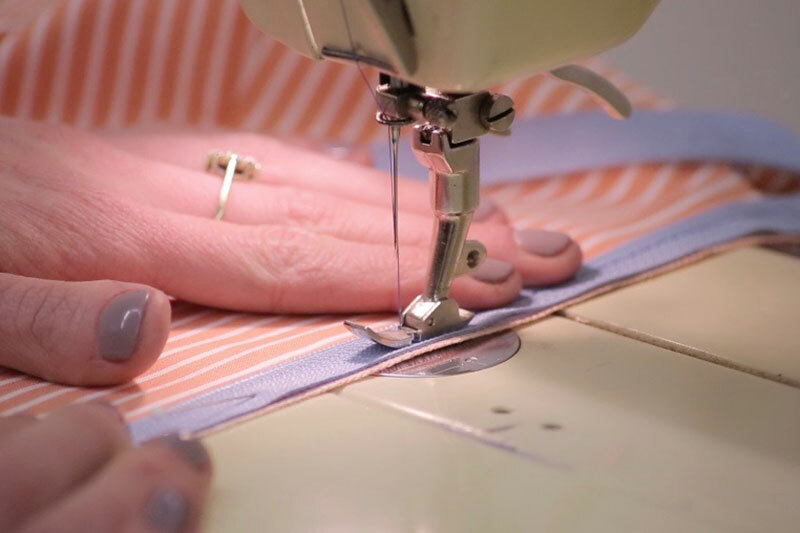 The 1″ seam allowance on the center back skirt seam is needed to create the “lap.” On the lining there is no lap, therefore, no extra seam allowance. I had the same problem with blurred photos, but saved this post as a pdf on my iPad and it’s much clearer. I followed it religiously, and successfully sewed my first lapped zip – thanks!